I'll take Classic Desserts for $200, Alex! This dessert is a sweet and rich baked Custard with a glass-like, caramelized Sugar top. The question? 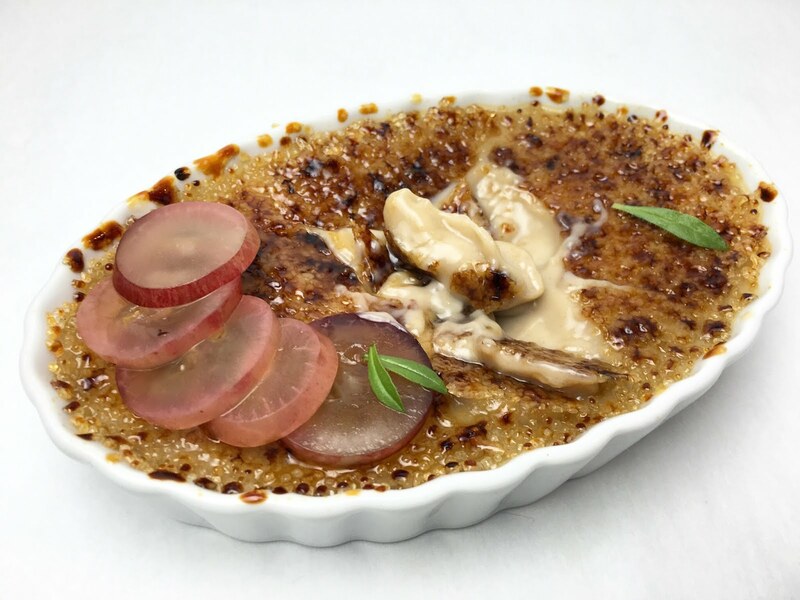 What is a Crème Brûlée? A well-executed Crème Brûlée is the ultimate illustration of perfection in simplicity. Cream, Egg Yolks and Sugar come together in a silky smooth Custard. A crunchy, brûléed (i.e. caramelized) Sugar top creates the ideal textural contrast. Any pastry chef worth his Salt (or more appropriately, his Sugar) should be able to make a Crème Brûlée in his sleep (although I would advise against using a culinary torch while semi-conscious). As you might imagine, it featured prominently in culinary school. So, too, was a Crème Brûlée an appropriate test for the fourth episode of The Great British Bake Off, which focused on plated desserts. A basic Crème Brûlée is delicious, but a simple Custard is also an amazing blank canvas for some culinary creativity. Forever swayed by the Italian influences of my first restaurant job at Osteria Morini, my mind immediately went to a Toasted Hazelnut incarnation. That's not an inexpensive choice (oh, Whole Foods pricing!) But, my god, is it delicious! Don't be fooled by the literal translation of Crème Brûlée. "Burnt cream" is a horrible misnomer. This dessert is pure, silky, sweet deliciousness. 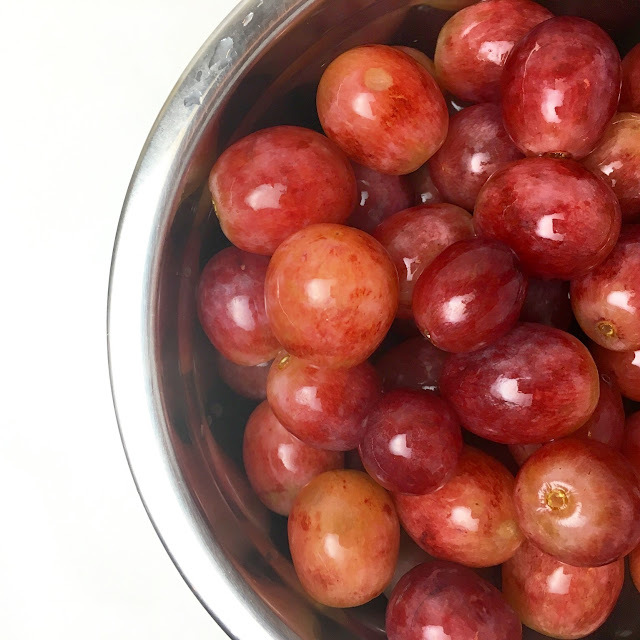 When I started testing this recipe, I thought Pickled Red Grapes would be a tasty accompaniment. I was correct... the Pickled Grapes were tasty. Quick and easy, Pickled Red Grapes provide an amazingly intense pop of flavor. But this particular pop works better in a bright summer salad. Atop a sweet and rich Crème Brûlée they were... unpleasant. When it comes to Crème Brûlée, stick with classic garnishes like Raspberries. You can't go wrong with Raspberries. But if you're interested in the Pickled Grapes, I've still included the recipe below. The basic recipe for a Crème Brûlée Custard is nothing more than Cream, Egg Yolks and Sugar. Remember these simple ratios, and you'll always be able to whip up a basic Crème Brûlée. And while a basic version is fine (anyone will certainly enjoy a properly executed Custard, both sweet and smooth) a creative mix of enhancing flavors will make things more exciting. For this recipe, I've gone with Toasted Hazelnuts and a blend of complementary spices (e.g. Cinnamon, Ginger and Nutmeg). I've seen recipes for Hazelnut Crème Brûlée that call for flavoring the Custard with things like Hazelnut flavored non-dairy creamer. Gross! For the real deal, just make an infusion with Toasted Hazelnuts and Cream. Making a Cream Infusion is very easy - just bring Cream to a simmer with any of a variety of flavoring components (e.g. Toasted Nuts, Vanilla Beans, Cinnamon Sticks, Teas, etc.) and allow those ingredients to steep. A quick 30 minutes will extract a good amount of flavor and completely transform the Cream. Let those ingredients rest overnight in the refrigerator, and the flavor will be that much more intense. 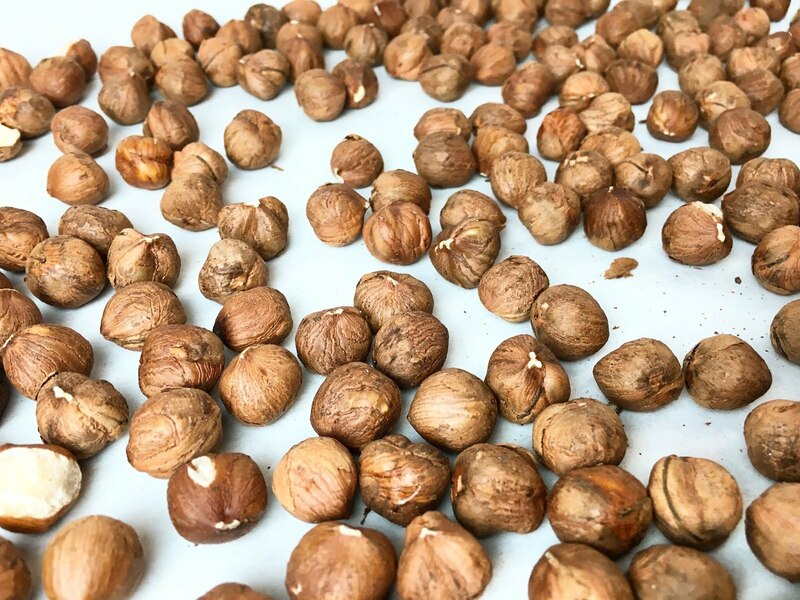 For the Toasted Hazelnut Cream Infusion, begin by toasting Raw Hazelnuts at 350 degrees Fahrenheit (177 degrees Celsius) for 15-20 minutes, or until the Hazelnuts are deeply toasted and fragrant. As the Toasted Hazelnuts cool, bring Cream to a gentle simmer in a medium pot. Add any other spices (in this case, Cinnamon, Ginger and Nutmeg) to the Cream as it warms. As soon as they are cool enough to handle, roughly chop the Toasted Hazelnuts before adding them to the warming Cream. Chopping the Hazelnuts before adding them to the Cream will help impart more flavor during the steeping process. Allow the Cream to simmer for 2-3 minutes before removing the pot from the heat. When the Cream is simmering, monitor the pot closely. Cream can quickly boil over and create a real mess. Remove the pot from the heat and transfer the Steeped Cream to an ice bath with a piece of plastic wrap placed directly on the surface (to prevent a skin from forming). As soon as the Steeped Cream has cooled, place it in the refrigerator to infuse overnight (or up to 48 hours). When you are ready to make the Crème Brûlée Base, strain the Steeped Cream through a fine mesh sieve. 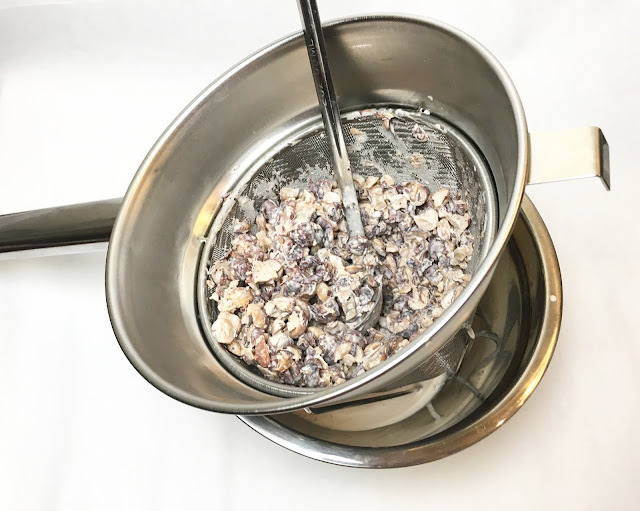 Use the back of a ladle to help squeeze the Toasted Hazelnut Infused Cream from the chopped Hazelnuts. The Hazelnuts will have absorbed a surprising amount of Cream during the steeping process. If you find that you do not have enough Toasted Hazelnut Infused Cream for the final Crème Brûlée recipe, you can make up the difference with some plain Cream. Toasted Hazelnut Cream Infusion in hand, it's time to make the final Crème Brûlée Base. In a medium pot, combine the Toasted Hazelnut Cream Infusion with half of the recipe Sugar and bring it to a gentle simmer. As the Cream mixture is warming, combine the Egg Yolks and the other half of the recipe Sugar in a mixing bowl and whisk it until it becomes light and airy. When the Cream mixture reaches a simmer, temper the Egg Yolk mixture by slowly streaming the hot Cream into the Egg Yolk mixture while actively whisking. Strain the hot Crème Brûlée Base through a fine mesh sieve into a bowl. Let the Crème Brûlée Base rest for a couple of minutes, allowing air bubbles to rise to the surface. Carefully skim the resulting foam from the top of the Crème Brûlée Base. It is important to skim the foam from the Crème Brûlée Base because any bubbles on the surface will leave marks when baked. Baking the Crème Brûlée in a water bath is critical. To achieve the desired soft and silky texture of a perfectly baked Custard, the Egg Yolks must be cooked very carefully. When Eggs are cooked too quickly and at too high a heat, they will curdle. The various proteins in an Egg set at different temperatures. By approximately 180 degrees Fahrenheit (82 degrees Celsius), all of the proteins will set, thickening a baked Custard. So why doesn't a Crème Brûlée become a curdled mess if it is baked at 325 degrees Fahrenheit (163 degrees Celsius)? First, you have to consider the other ingredients in the Crème Brûlée Base (i.e. Sugar and Cream). The Sugar and the Cream create a physical barrier that makes it more difficult for the proteins to set. The Egg Yolks must be heated to an even higher temperature to set. The second reason why the Egg Yolks do not curdle in a 325 degrees Fahrenheit oven is the water bath. Water can never exceed 212 degrees Fahrenheit (100 degrees Celsius), assuming that you are baking at sea level. Above that temperature, water will boil and convert to steam. By baking the Custard in a water bath, the Egg Yolks are kept at a safe, consistent temperature. 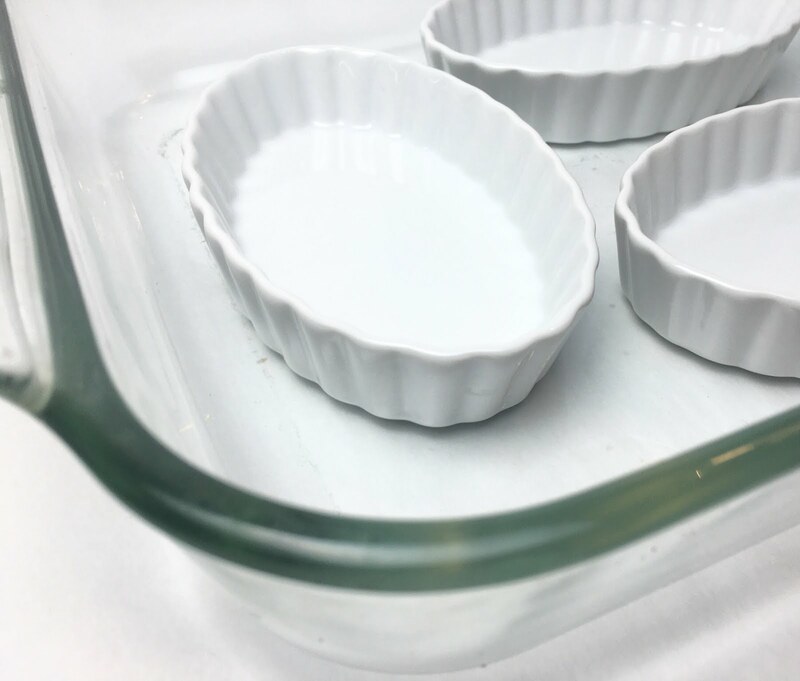 Filling ramekins and a water bath might seem like a simple task, but it is so easy to slip, trip, spill or slosh! Fill the individual ramekins and the water bath at the oven. This helps to prevent unintentional spilling. Place the empty ramekins in an empty baking dish with steeper walls to serve as a water bath. At the oven, fill the ramekins with the Crème Brûlée Base to just below the lip. Next, fill the baking dish with water until the level reaches approximately halfway up the sides of the ramekins. Cover the water bath with aluminum foil and gently slide it into the center of the oven at 325 degrees Fahrenheit (163 degrees Celsius). Bake the Crème Brûlées for approximately 25-30 minutes. After 25 minutes, check the Crème Brûlées frequently (being careful of the steam released when you remove the foil). The Crème Brûlées are done when the Custard is just set. When you tap the ramekin, the Custard should just barely jiggle. As the Custard cools, it will thicken further. Immediately remove the Crème Brûlées from the water bath and place the ramekins on a wire cooling rack. It is important to remove the Crème Brûlées from the hot water to stop the cooking process. When they have fully cooled to room temperature, individually wrap the Crème Brûlées with plastic wrap and store them in the refrigerator until cold (ideally overnight). Be careful when wrapping the Crème Brûlées in plastic wrap. If the plastic wrap touches the surface of the Custard, it will stick and ruin the perfect appearance. Also, do not wrap the Crème Brûlées until they have completely cooled. As the Crème Brûlées cool, they continue to release moisture. Wrapping the Crème Brûlées prematurely will result in condensation on the inside of the plastic wrap which will then drip onto the Custard. When you are ready to serve the Crème Brûlées, it's time to break out the torches! 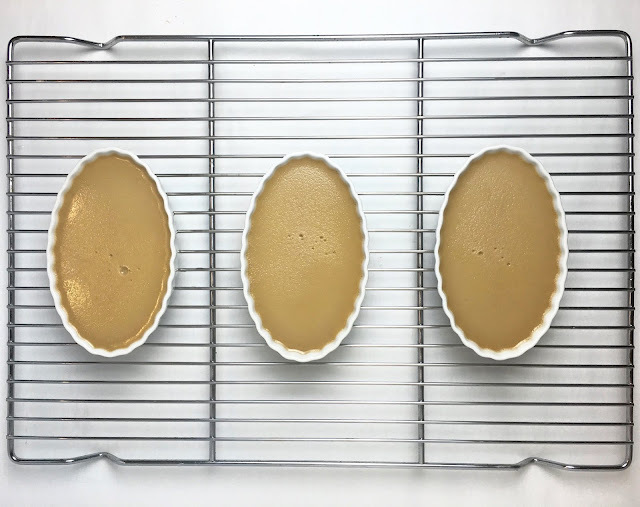 The Great British Bake Off required contestants to finish the Crème Brûlées in the oven, using the intense heat of the broiler to caramelize a layer of Sugar on the top of each Crème Brûlée. This method works, but the prolonged, intense heat of the broiler can potentially curdle the oh-so-carefully baked Custard. It may be the old-school technique, but when a culinary torch is available and works just as well (if not better), there is no reason to pass it up. Any type of Sugar can be used to form the top crust for the Crème Brûlées. White Granulated Sugar caramelizes quickly and easily, and it produces a thin, simple crust. Turbinado Sugar (i.e. Sugar in the Raw, which is a coarser and less-refined product) is my pick. It has a slightly deeper flavor that adds more than just sweetness to the final dish. Regardless of the type of Sugar used, only use enough Sugar to form a thin, even layer over the surface of the Custard. A crust that is too thick can detract from the final dish. Wait to caramelize the Sugar until just before serving. Remove the chilled Custards from the refrigerator. Sprinkle a thin and even layer of Sugar over the surface of the Crème Brûlée. Using a culinary torch, caramelize the Sugar by slowly and evenly moving the torch over the surface of the Custard, holding the flame a couple of inches from the surface. Be careful not to burn the Sugar. It should melt and caramelize into a golden crust. Either serve the Crème Brûlées immediately or return them to the refrigerator to chill for a couple of minutes before serving (this is a matter of personal preference). 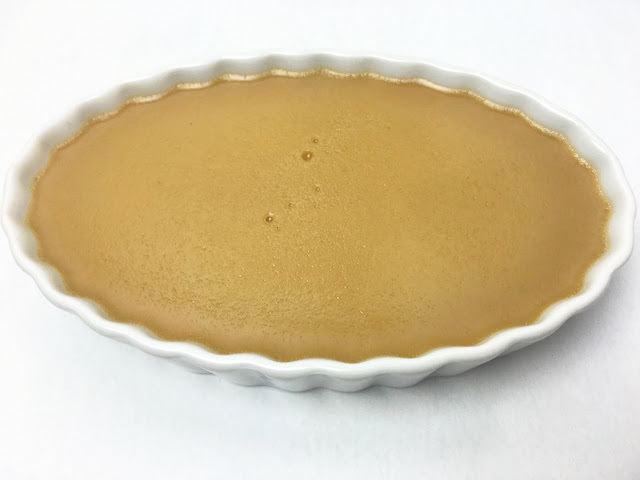 The Toasted Hazelnut Infused Cream and the Crème Brûlée Base will keep for up to a week (or until the expiration date of the Cream, if earlier) in an airtight container in the refrigerator. The baked Crème Brûlées can be kept for up to three days when wrapped in plastic wrap and stored in the refrigerator. After the Crème Brûlées have been finished with a brûléed top, they should be served immediately. The caramelized Sugar top will absorb moisture and become wet and sticky with time. * If you are unable to strain 600g (2.5 Cups) of Toasted Hazelnut Infused Cream from a single recipe, you can make up the difference by adding fresh Cream. 1. Toast the raw Hazelnuts on a parchment lined sheet tray at 350 degrees Fahrenheit (177 degrees Celsius) until deeply toasted and fragrant - approximately 15-20 minutes. Once toasted, remove the Hazelnuts from the oven and allow them to cool until they can be safely handled. 2. While the Hazelnuts cool, combine the Heavy Cream, Cinnamon, Ginger and Nutmeg in a medium pot and bring it to a gentle simmer. Once the Hazelnuts are cool enough to handle, roughly chop them. Add the chopped Hazelnuts to the Heavy Cream and steep the mixture at a gentle simmer for 2-3 minutes. 3. Remove the pot from the heat and transfer the Steeped Cream to an ice bath with a piece of plastic wrap placed directly on the surface. Once cooled, transfer the Steeped Cream to the refrigerator and allow it to infuse overnight (or up to 48 hours). Chef's Note: Plastic wrap on the surface of the Cream will prevent a skin from forming. 4. Strain the Toasted Hazelnut Infused Cream through a fine mesh sieve to remove the Hazelnuts. Use the backside of a ladle to squeeze as much Cream from the Hazelnuts as possible. - The Toasted Hazelnut Infused Cream will keep for up to a week (or until the expiration date of the Cream, if earlier) in an airtight container in the refrigerator. 1. Combine the Toasted Hazelnut Infused Cream, Sugar (50g) and Salt in a medium pot and slowly bring it to a gentle simmer. As the Cream mixture is coming to a simmer, actively whisk together the Egg Yolks and Sugar (50g) until they are light and airy. 2. Once the Cream mixture is hot, make the Crème Brûlée Base - temper the Egg mixture by slowly streaming the hot Cream mixture into the Egg mixture while actively whisking. 3. Strain the tempered Crème Brûlée Base through a fine mesh sieve. 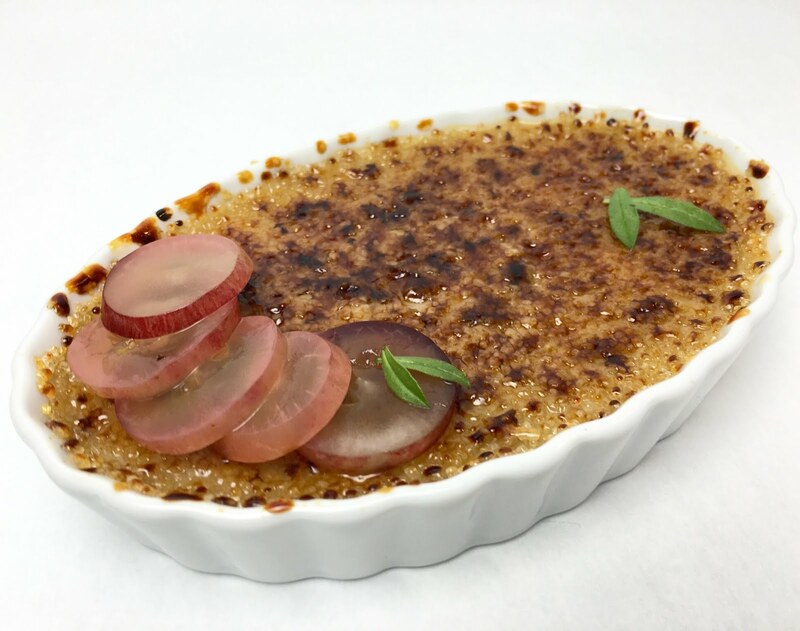 Allow the Crème Brûlée Base to rest for a couple of minutes so that any air bubbles rise to the surface. Carefully skim the resulting foam from the surface of the Crème Brûlée Base. Chef's Note: It is important to skim the foam from the Crème Brûlée Base. 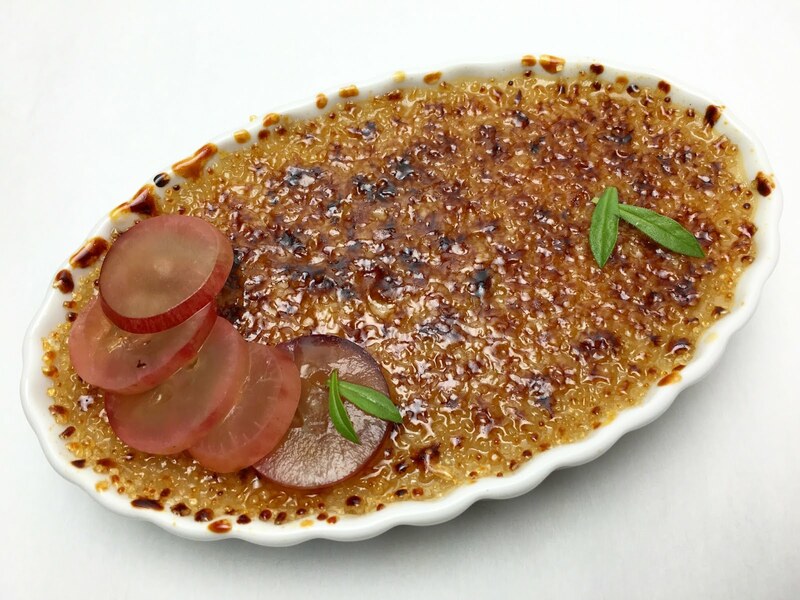 Any bubbles on the surface of the Crème Brûlée Base will leave marks on the surface when baked. 4. 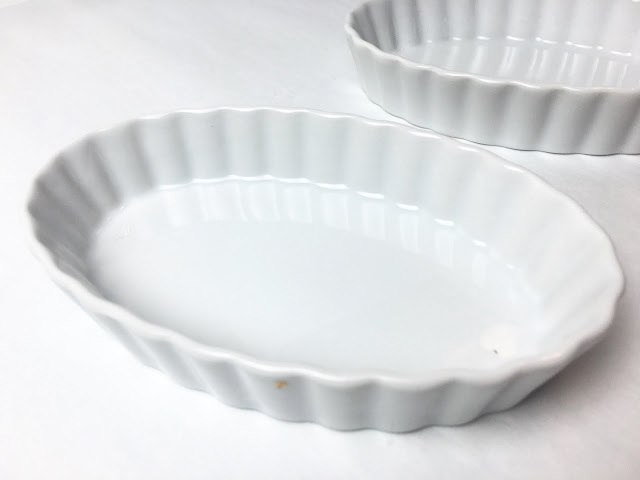 Working at the oven, place eight shallow, fluted Crème Brûlée ramekins in a large baking dish (or two dishes, if necessary). 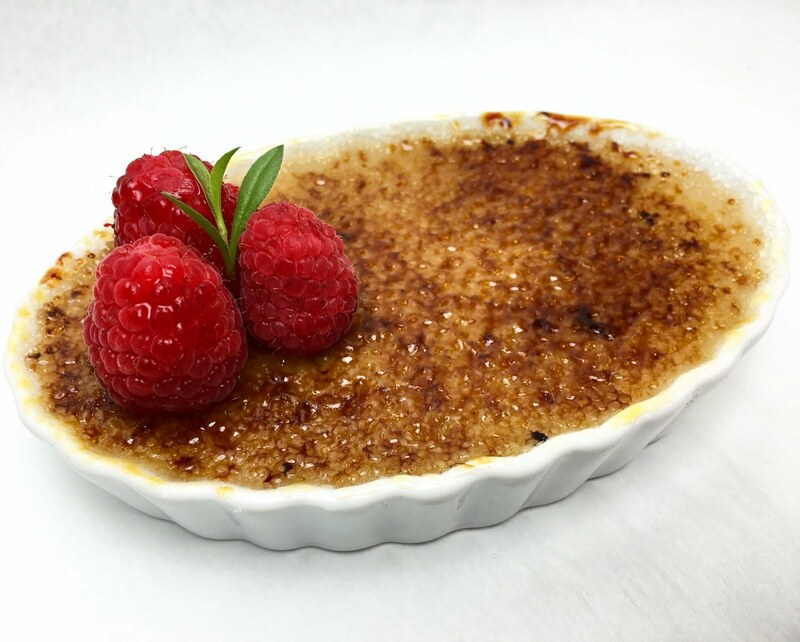 Fill each ramekin to just below the rim with Crème Brûlée Base. Next, fill the baking dish with water so that the level of the water reaches halfway up the sides of the ramekins. Tightly cover the baking dish with aluminum foil. Chef's Note: Fill the ramekins and the water bath at the oven. It can be very difficult to carefully move a water bath. 5. Bake the Crème Brûlées at 325 degrees Fahrenheit (163 degrees Celsius) for approximately 25-30 minutes or until just set. When gently tapped, a properly baked Crème Brûlée should slightly jiggle. 6. 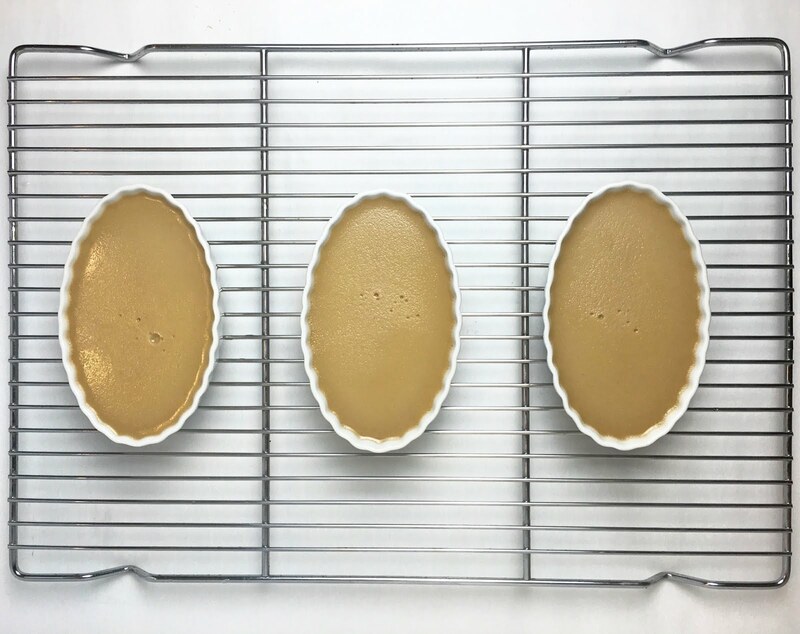 Immediately remove the individual ramekins from the water bath and allow the Crème Brûlées to cool to room temperature on a wire cooling rack. When fully cool, cover the individual Crème Brûlées with plastic wrap and transfer them to the refrigerator until cold (ideally overnight). The Crème Brûlées will set more as they cool. Chef's Note: Do not cover the Crème Brûlées with plastic wrap before they have fully cooled, otherwise moisture will condense on the inside of the plastic wrap and drip on to the surface of the Crème Brûlées. 7. When ready to serve, remove the Crème Brûlées from the refrigerator. Sprinkle a light, even coating of Turbinado Sugar on the surface. Caramelize the Turbinado Sugar using a culinary blow torch or in the oven under the broiler. 8. Either serve the Crème Brûlées immediately or return them to the refrigerator to chill for 5-10 minutes before serving (this is a matter of personal preference). - The Toasted Hazelnut Crème Brûlée Base will keep for up to a week (or until the expiration date of the Cream, if earlier) in an airtight container in the refrigerator. - The individual, baked Crème Brûlées can be kept for up to three days in the refrigerator when wrapped in plastic wrap. Do not attempt to store Crème Brûlées after the tops are caramelized with Sugar. 1. Wash and stem the Red Grapes. Sort through the Red Grapes and remove any that are soft or split. 2. Combined the Vinegars, Sugar, Mustard Seeds and Salt in a pot over high heat. Bring the Pickling Liquid to a boil. Reduce the heat and allow the Pickling Liquid to simmer for 2-3 minutes. 3. With the Red Grapes tightly packed into a sealable, heat-safe container (e.g. cambro or mason jar), pour the Pickling Liquid over the Grapes so that they are completely submerged. 4. Loosely cover the container and allow the Pickling Liquid to cool to room temperature. When cool, tightly seal the container and store the Pickled Grapes in the refrigerator. Allow the Pickled Grapes to soak in the Pickling Liquid for at least 24 hours. The intensity of the flavor will increase with time. - The Pickled Grapes will keep well in an airtight container in the refrigerator for several weeks. The intensity of the flavor will increase with time. Eggless cookies are my personal favorite as they are seemingly easy to make than those using the eggs. Thanks for sharing all the amazing recipes here.